Lancashire Music Hub have teamed up with Chorley Sports Partnership to make sure every primary school pupil has the opportunity to sing. 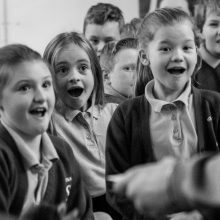 We are running inspiring workshops, training for teachers and celebratory festivals and performances throughout the Spring and Summer terms. The new Chorley Children’s Choir will give young vocalists age 8-11 of all abilities the chance to sing new and popular songs with the brilliant Tim Uffindell and perform at exciting events, and on Thursday 4th July, the historic Town Hall will host Chorley’s first “Big Sing”, giving schools the chance for their pupils to perform alongside inspiring vocal leaders and professional musicians.